A hedge is a dynamic entity, it will always be trying to develop into a line of trees through natural succession. We can think of a hedge as a woodland edge because often the species we find in a hedge are also to be found as part of a woodland edge. Indeed many of the oldest hedges were formed as woodland was cleared and the woodland edge left as a boundary. If we require a hedge not to turn into a line of trees or we want to keep it thick and stock proof, we want to provide certain habitats for specific species or we just want to keep a hedge â€˜neatâ€™ then we need to manage hedges. Most of the British landscape is man made in that human activity often through farming has created habitats that would all but disappear without management. Heathland, chalk grassland and moorland are just three examples. Hedgerows are no different, they were created by man and require management to ensure their both their condition and their survival. Management has to be sympathetically carried out and over management or neglect can be a threat to hedges. Over management is caused by excessively tight trimming over a long period. It is more typically seen on single species Hawthorn hedges which in time form a bottomless mushroom shape and slowly die out. Many Hawthorn hedges were regularly layed up until the 1950s when there was far more farm labour available. Since then, more often than not they have been cut at the same height each year and this has resulted in slow decline in condition. Even some species rich hedges growing on banks have over time degraded due to excessive cutting. Repeated cutting at the same height may be done in the name of neatness or for safety reasons along roadsides, but within the hedge each stem is going through a natural ageing process. Stems become larger and often knarled and twisted due to the constant cutting taking place above. In effect the hedge is under stress and constrained by such a regime and if we are not careful we may loose many hedges imperceptibly as they slowly fade away. At some stage we need to relax the cutting regime and allow the hedge to incrementally increase in height. By doing this we allow the hedge to â€˜breathâ€™ and if we act before stems start to die out then a hedge can remain â€˜healthyâ€™ for a considerably longer time. It is the density of stems in a hedge that is crucial to this process. If we trim a hedge at the same height for a long time, stems start to die out and even if we then did allow it to gain height options for management are far less. For example a hedge which is allowed to grow may not be able to be layed because the gaps are just too many and even if we were to coppice it to ground level we would have the extra expense of planting up the gaps at the same time. Best of all is to learn to â€˜readâ€™ a hedge and allow it to incrementally increase in height in a controlled manner before it becomes over stressed thus keeping all the stems healthy. If we then choose to rejuvenate the hedge either by laying or coppicing we have enough stems to form the basis for the next thick, dense hedge to grow. At the other end of the scale neglect or lack of management allows a hedge to proceed through its natural life cycle in an uncontrolled manor and the inevitable end of this is an over tall, aging hedge once again with few options for management other than coppicing and planting up gaps. Whilst tall old hedges provide an excellent nectar source from flowers and perhaps ivy and can be an important source of fruit they will ultimetly become unstable and start to collapse. It may also be the case that they turn into a line of trees if trees species are able to colonize. Lines of trees can be important for bats and larger tree nesting birds but a balance has to be found between loosing the rich habitat of a dense hedge through neglect and allowing some hedges to develop into trees. A Cut Above The Rest – Introduction from Hedgelink on Vimeo. The advice offered in this DVD will help us keep our rich hedgerow heritage healthy and relevant to the modern world, and offer our hedges a brighter future. ‘A Cut Above The Rest’ is available as a DVD free from Natural England’s Enquiry Service. Telephone: 0845 600 3078 enquiries@naturalengland.org.uk. This DVD was produced by the Rural Media Company, with funding from the CPRE, Department for Food, Environment and Rural Affairs, National Hedgelaying Society, Natural England, RSPB and The Tree Council. For more clips see our Vimeo page. We need to recognise the life cycle of a hedge. We must learn to allow a hedge to develop in a controlled manner through time never subjecting the hedge to stresses which over the long-term may ruin its condition. As land managers we must try and literally â€˜buyâ€™ time by extending the healthy life span of a hedge for as long as we can before we ultimately recognise that we have to intervene and rejuvenate the hedge from the base either through laying or coppicing. It may be useful to imagine a scale from 1 to 10. Let us say that a hedge that scores 1 is an over trimmed, gappy and dying hedge whilst at the other extreme a hedge that has turned into a line of trees is a 10. In between are all the stages of growth and decline that a hedge may go through during its life. In the ideal world it would be perfect to maintain a hedge between a score of perhaps 3 and 8 that is, between being a healthy trimmed hedge and a healthy tall hedge. As managers we can then base our decisions on slowing down but not altogether halting the natural changes that the hedge wants to go through. By doing this on all hedges on a holding we achieve the ideal mosaic of different shapes and sizes that makes our countryside so special. Download The hedgerow management cycle (PDF) leaflet to read more about how to ‘read’ a hedgerow and make cost-effective decisions about management to ensure a heathly and long future for hedgerows. There is no doubt that at some stage in the life of a hedge that it will be trimmed. This is done for many reasons including neatness, to thicken the hedge, to keep it under control, and, in situations where there is a health and safety risk for example alongside a road. As has been said earlier constant long term trimming at the same height places a hedge under stress and can lead to a deterioration in condition but sympathetic trimming can indeed thicken a hedge by creating new points from which growth can â€˜tillerâ€™ out. There are numerous types of tractor mounted hedge trimmer on the market the most common of which is the flail head. This uses hanging blades which rotate rapidly on a vertical plain and cut and mulch woody growth very successfully. They can do a great job but can also create an eyesore when larger woody growth is attempted. There are knife blade cutters, either a reciprocating knife type or circular spinning blades rather like a flymo mower. These leave a very neat cut and are ideal for light growth with the disadvantage of not mulching up the cut brash. Finally there is a circular saw blade machine. 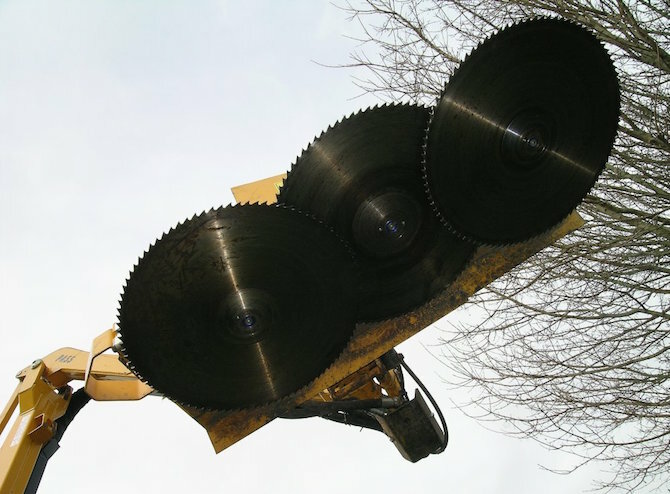 The first circular saws were developed after the war and were used to reshape overgrown hedges that had been neglected. Today very efficient circular saw blade attachments are available with up to 5 large blades on one head. They are ideal for â€˜re-shapingâ€™ a hedge after a period of non intervention and can be used as part of a long term â€˜hands offâ€™ cutting regime. Once again the disadvantage is the clearing up of brash but ironically the larger the fallen brash the easier it is to push up and burn with a front loader. In 1995 Silsoe College, on behalf of the Devon Hedge Group, compared the costs of cutting hedges once every three years with cutting every year. They also looked at the costs of raising the cutting height a few inches each year, and of leaving hedgerow trees. Their research included the costs of reduced crop yields due to loss of productive land and shading effects. Farms typical of both Devon and the Midlands were covered. To see the results of this research, download the research paper: The economics of sustainable hedge cutting (pdf 1.5MB). Also read about the socio-economic importance of hedges. A review of research on the effects of hedgerow management and adjacent land on biodiversity. This report starts with a review of hedge management, including its history, current status and costs. It then continues by examining what is known about the effects of hedge management on wildlife, including the effects of associated land use management. This main section of the report has been divided up according to major taxonomic groupings with a section devoted to each. Hedgelink, in conjunction with OPAL (the Open Air Laboratories network), has produced the following 10 top tips to help you make your hedge a really good wildlife habitat. Close interwoven branches in your hedge provide safe nesting and roosting places for small birds like thrushes, finches, robins, hedge sparrows and wrens. Open hedges tend to attract magpies, crows, pigeons and squirrels. Holly is a very good hedging plant, forming compact dense bushes that give excellent protection during the winter. Leave trimming your hedge until late winter if you can. Hedgerow berries and other fruit provide vital food for birds like fieldfares, redwings and other thrushes throughout the winter. The earlier you cut, the less food will be available to help these birds and other wildlife survive through the most hostile time of year. And never cut during the bird breeding season (1 March to 31 August) unless you have to, for safety reasons. Although cutting is necessary to keep a hedge thick, if it is cut back to the same point every year it will produce few flowers or berries. So try and cut just once every two or three year,s or each time let the hedge grow out and up a little. Another alternative is to cut just one side or the top each year. If you have to cut your hedge frequently, then try and leave occasional berry or fruit bearing trees to grow to maturity â€“ one mature hawthorn can produce as many berries as 200 metres of hedge cut every year. Shrubs that occur naturally in Britain provide habitat and food for far more insects and other animals than those introduced from abroad. If you can, include a range of different species to provide food throughout the year â€“ willows and blackthorn for early season nectar; hawthorn, bramble and rose for summer flowers and autumn berries; ivy for autumn nectar and late winter berries. Hedges with plenty of vegetation at the base support lots of wildlife. Flowers like primroses and knapweed provide nectar and pollen for bees and other beneficial invertebrates, while tussocky grasses provide safe places for beetles, spiders and the like during the winter. Frogs, toads, newts and lizards like dense growth at the base of hedgerows for food, cover and places to hibernate. The hedgehog likes thick cover too! If you have room, big mature trees, especially native ones like oak, ash and beech, will increase the amount of wildlife that uses the hedge tremendously. Insects will congregate around the crown and beneath the canopy, providing rich feeding for birds and bats. Small trees, like holly, rowan and crab apple, are also very valuable, especially for their flowers and rich berry and fruit crops. Many hedge problems, including neighbour disputes, happen because fast-growing plants have been used for quick results, producing hedges that rapidly become too high and are difficult to maintain. Think carefully about why you want a hedge and about the site before choosing your shrubs and trees. Many creatures avoid crossing open spaces because they it makes them vulnerable to predators. If your hedge is linked to other hedges, or to a woodland or pond, it will provide safe passage for wildlife to move through both rural and urban landscapes. Bats and dormice are among many creatures that dislike even small gaps. Do keep a close eye on your hedge and see what lives in it, and what parts of the hedge are most favoured by the wildlife you want to attract. You can then tailor your management accordingly. Keep a record of the species you see. Here you can also download a copy of these Top 10 Tips for a Healthy Hedge (PDF 335 KB). A report and a series of leaflets have recently been published following completion of a research project funded by Defra. The project, Understanding the combined biodiveristy benefits of the component features of hedges, aimed to increase our understanding of the role hedges play in supporting biodiversity. The report presents information on the importance of managing all hedge components optimally for biodiversity and the inter-relationship of the five structural components of hedges (trees, shrubs, hedge base, field margin and ditches). The focus is on priority species listed in Section 41/42 of the Natural Environment and Rural Communities Act (2006) and equivalent legislation in other UK countries (i.e. former BAP species), together with species listed as Biodiversity 2020 Farmland. A suite of nine advice sheets relating to particular animals or assemblages of animals were written based on analysis. At a farm scale, there was very little conflict between the requirements of the chosen species. It was therefore possible to produce a further advice sheet, giving general advice on optimal management for hedge biodiversity. Hedgelink and CFE (Campaign for the Farmed Environment) has produced a leaflet on managing hedges to benefit pollinators. It explains why hedges are good for pollinators and what you can do to maximise the benefit. In the UK, there are around 267 species of bee and their diversity, coupled with their exclusive diet of pollen and nectar, means bees are regarded as the main pollinators of most of our wildflowers and insect-pollinated crops. Bees need food (plants providing pollen and nectar) and sites for hibernation and nesting. Farming can help provide these resources for bees by taking up the relevant measures under the CFE. By encouraging pollinators, farmers can also improve crop productivity. 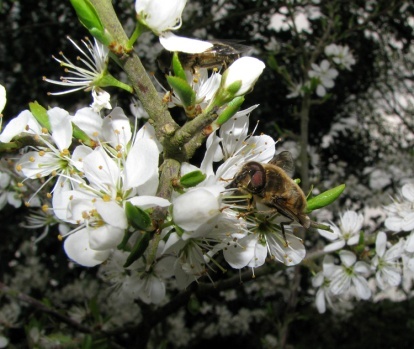 Pollination is vital to the production of many horticultural and agricultural crops in the UK. This pollination is valued at Â£510m per year. The lealfet complements the CFE guide Pollinator management for you farm business.